May 18, 2015 May 17, 2015 Nefer Khepri, Ph. D.
I asked the cards in general, what do we all need to know for the week ahead? I drew 3 cards representing Body, Mind & Spirit. 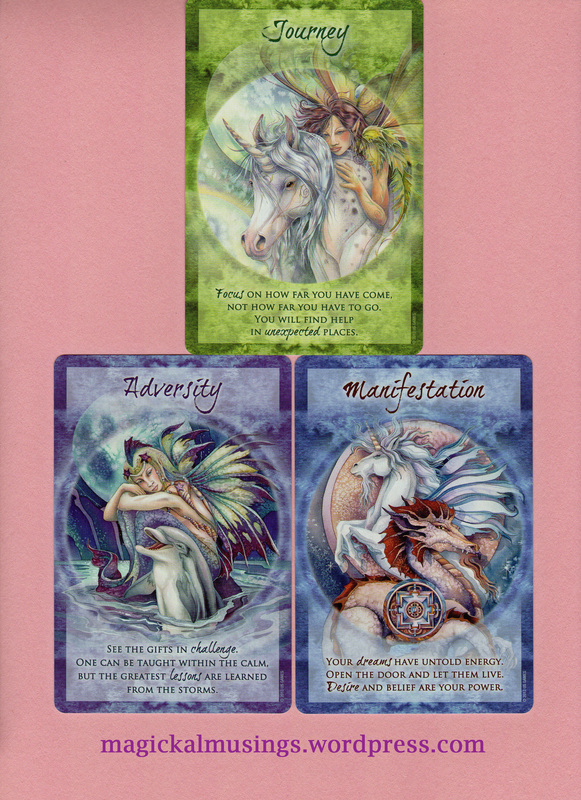 The Magical Times Empowerment Cards by Jody Bergsma. US Games, Inc. 2013. BODY: Journey: Focus on how far you have come, not on how far you have to go. you will find help in unexpected places (original emphasis). MIND: Adversity: See the gifts in challenge. One can be taught within the calm, but the greatest lessons are learned from the storms (original emphasis). SPIRIT: Manifestation: Your dreams have untold energy. Open the door and let them live. Desire and belief are your power. For an oracle deck, The Magical Empowerment Cards can provide some very heavy duty readings, and this reading is a good example of that. (For my review, please see yesterday’s post). This reading starts with a Journey, as do most things. The first card is saying we’re on a journey and heading toward somewhere & we need to focus on how far we’ve already come, not how far we have yet to travel. Adversity tells us there will be obstacles along our path. Well, that’s life. There are obstacles and within them we find our greatest lessons. The final card is Manifestation. If we’re brave and undertake the journey, deal with the adversity we must all face, then through our desire and faith our dreams can manifest. This week may prove to be one of major achievements and dreams realized as long as we don’t allow the blocks we run across to overwhelm us. Instead, look past them and keep your eyes on your goal. Next Happy World Tarot Day! Contest for 3 Free Readings!